With the old church at the top of the village and lavender fields around it, Bonnieux is a lovely village. Bonnieux, located just 27 kilometers (17 miles) from L'Isle-sur-la-Sorgue, 20 kilometers (12 miles) from Gordes, and about the same distance from Roussillon (map), is most recently famous because of Peter Mayle's humorous memoir, A Year in Provence. Although Mayle's focus was more on nearby Ménerbes, Bonnieux also figures prominently in his tales. You can easily visit Bonnieux on a day trip from any of the towns mentioned above, or you can use Bonnieux as your base for visiting them. Approaching Bonnieux from Ménerbes, you are treated to this lovely view of the village. 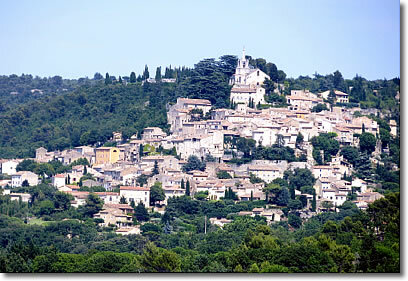 Bonnieux is one of the larger hilltop villages of the Luberon, with more amenities than some of the smaller ones. It would make a good base for exploring the Luberon. Gorgeous views from the old church and the cedar grove at the top make the climb up the steep narrow streets well worth while. 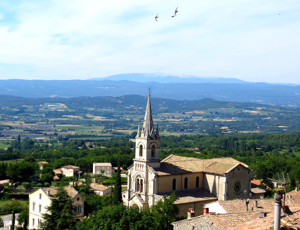 On a clear day you can see Mont Ventoux in the distance, and may even be able to pick out the villages of Gordes and Roussillon. The nearby village of Lacoste is also visible. Fields of lavender, in season, color the landscape purple. 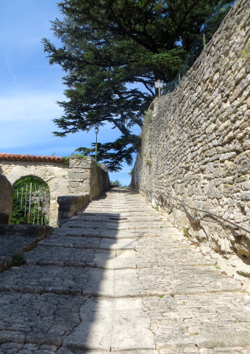 Bonnieux was founded in the 10th century, and the Church of St Sauveur was built in the 12th century. Now called the Vieille Église, or old church, St Sauveur was replaced as a place of worship in the 19th century by the church in the lower part of the village, called L'Église Neuve, or new church. You can still visit the lovely interior of the Vieille Église; it hosts some concerts and a Christmas crèche. with Mont Ventoux in the distance.